Orange County Fashion Week was once again a busy week packed with both emerging and established designers from around the globe. This season, the choice to feature menswear on Cruise Collection night made a big impact. 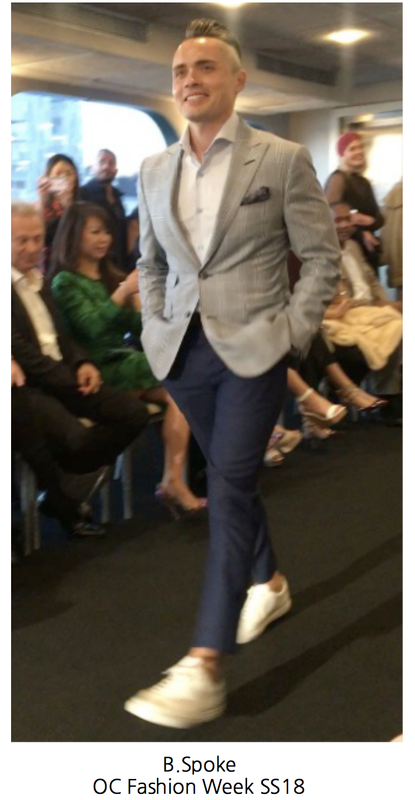 During a sunset cruise aboard the gorgeous Eternity Yacht, attendees of this exclusive event were treated to a runway show by B.Spoke. CEO and Founder Dave Welch makes high end, made-to-measure suits and sportswear. Making this even more special were the models: many of whom are associates & clients of B.Spoke, showing off their own immaculate style and strengthening those SoCal ties. In speaking to other attendees, it was apparent that all were impressed by the quality and style of B.Spoke's clothing. I repeatedly heard how it inspired the male attendees to add color, pattern or new silhouettes to their wardrobe. B.Spoke's show was clearly a highlight of this season's collections and hopefully we will see more menswear featured on the OC Fashion Week runways. Trousers that are cropped in length allow you to show off a gorgeous pair of shoes, like these loafers. Prints on the interior lining of jackets added flair and finesse. Pocket squares look fresh when they help tie in the color of the pants. A leather jacket was paired with white pants for a downtown chic look. Proving that it's all in the details: these pants featured a skull print that perfectly coordinated with his skull lapel pin. The classic three-piece suit looks sophisticated in plaid. This gorgeous jacket had a monochrome print that added subtle texture and uniqueness. A plaid jacket in a fun color adds instant style cred to an outfit. Black and brown can go together beautifully, as proven here. A pop of color goes a long way to add distinction to a look. I would definitely encourage men who may not ordinarily venture outside of their fashion "box" to try something new! Either visit a custom clothier like B.Spoke or just mix it up by playing with patterns, prints, and even pants lengths. After all, fashion fun is for the fellas too!